In a previous post, I discussed the elemental correspondences I find in individual natural fibers. In this one, I’ll continue with correspondences I’ve found to various weaves, covering commonly available fabrics in the U.S.A. The weaver’s terminology is woven into the very fabric of the English language. Entire trades and family names remind us of the processes used in the making of fabric: weaver, walker, fuller, dyer, draper, napier, tailor… Our language is full of fiber references: we have close-knit families, prize our heirlooms, find ourselfs at loose ends, spend time woolgathering, and find our good temper wearing thin. We can be fleeced by a dyed-in-the-wool con man, strung out on coffee, shuttled back and forth between two places, and find ourselves in a run-of-the-mill day job. 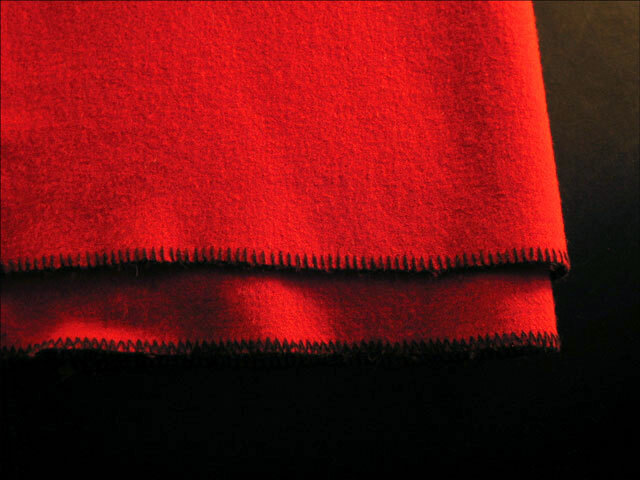 scarlet—originally meaning a rich woolen cloth. The expensive vivid color that wool scarlet was often dyed became the name of the color itself by the end of the middle ages. muslin—named for the Persion city of Mosul. Originally an exceptionally high quality fine-weave cotton, expensive and valued. Now commonly used in inexpensive sheeting, upholstery underining, and in drafting garment patterns. calico—first imported c. 1600 CE from the Indian city of Calicut. A fine even-weave cotton, commonly printed with patterned decoration. In the USA, calico today refers solely to the printed fabric. gauze—debatably either from the Arabic gazz (meaning raw silk) or the city of Gaza (where it was made). Originally a transparent open-weave silk. Today cotton gauze is used in many applications, from cheese-making, to medical bandaging, to insect netting that protects sleeping people in malarial regions. cambric, from the Flemish city Cambray. First referred specifically to finely woven linen shirting, later imitated in cotton. The now-commonplace chambray fabric originated similarly. Any weave can employ any fiber, in theory. It may not be all that practical to try weaving velvet out of flax, canvas of silk, or corduroy out of woolens, but it is at least possible to attempt. Of course, correspondences, as always, vary among individuals. If you’re familiar with fabrics and fibers, use your own sense of what’s true. If not, perhaps you can use this information to enrich your practice. Magical polarities further enhance the personality of a garment to suit its wearer. Although cold weather may demand a warm robe and cloak for an outdoor circle, any fiber can be used to make them. (Wool is the commonest choice for warmth.) But if allergies or magical properties prevent, then silk or cotton may fill the need. If a midsummer ritual calls for a “watery” fabric—to encourage empathic connections, perhaps—but even wool gauze (challis) seems too hot, cotton velour may answer, using the weave correspondence instead of fiber. As with any magical enterprise, the correspondences that work are those that ring true for you. The lightest, airy weaves used in clothing include gauzes, laces, chiffons, lawns, batistes, and challis. Such weaves intentially allow air to penetrate the fabric and reach the skin. Of these fabrics, modern gauzes, lawns, and batistes are usually cotton fiber, although linen lawn or batiste may still be found. Chiffons are most commonly seen in synthetic fibers that imitate the lustrous original (but expensive) silk. Silk chiffon is available from specialty importers. Challis is usually made of wool or a wool–silk blend. Wool challis is an instance of a fiber commonly used for warm and heavy fabrics being used to the opposite purpose. Other light and sheer fabrics include net, tulle, and mull. Most of these fabrics are transparent or translucent, and many are quite fragile, tearing or snagging easily. Tulle, for instance, is a type of netting (historically silk). Common uses in the twentieth century included veils (both bridal and for hats), as well as the 1950s “new look” use for the tiered petticoats that supported the gathered skirts of the post-war shirtwaist dresses—and are traditional in square-dance circles. Further, tulle has long been used for ballet costumes, from the token skirt called a tutu, to the longer full, floating skirts seen in nearly every production of The Nutcracker. Modern lace fabrics are most commonly machine-knit or woven using nylon, acrylic, acetate, rayon or polyester fibers. Some cotton lace fabrics (rather than edgings) have returned to the market in traditional lace patterns, and eyelet cotton never left it. Fortunately, the resurgent interest in natural-fiber clothing has made available a great many more traditional lace trims and fabrics. 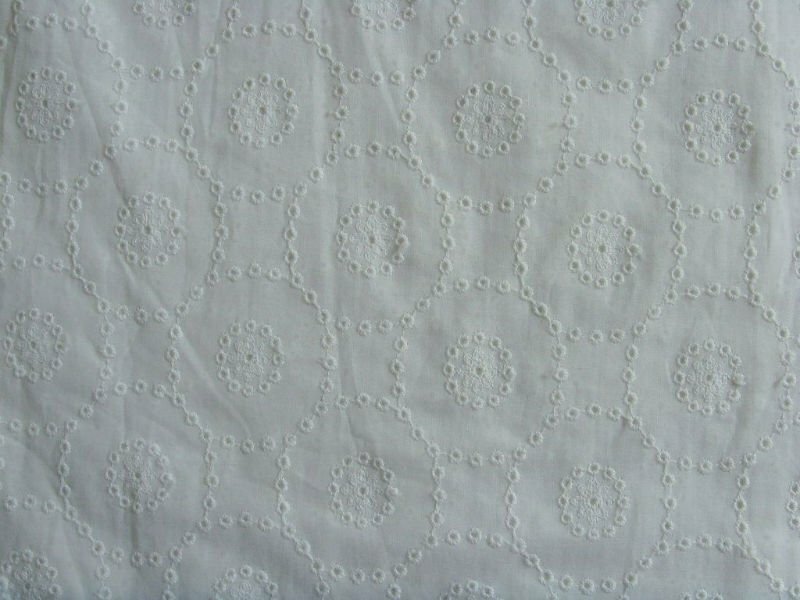 Readily available as edgings and trims, machine-made cotton eyelet is available as lace trims and full width fabrics. Machine-made cotton bobbin lace is more common as various widths of edging, from tiny picot weaves to several inches wide. Silk machine-embroidered laces are rarely available (as always, at a price). Traditional linen lace trims are also available in a few specialty locales. The workhorse clothing fabrics today are most often cotton, a fire fiber itself. Work, especially any that requires physical energy, likewise corresponds well with fire. When selecting fabric weaves to correspond with fire, I have selected those both historically worn for energetic occupations, as well as those worn in places and locales with high temperatures. Sturdy yet cool weaves such as broadcloth, corduroy, twill, denim, canvas (duck), seersucker, and serge are all in common use wherever hot conditions prevail: gymnasiums, gardens, kitchens, aboard ships. Twill originally described a weave pattern which produces a strongly diagonal appearance on one side; modern twill is usually that weave used in a single-color cotton. Twill weave is also used to produce both denim and serge. Cotton work shirts, once routinely dyed a paler blue than the indigo of brand-new blue jeans by re-using the same indigo dye bath for the lighter weight chambray fabric, gave rise to the term blue collar as one who worked a in physically laborious profession such as carpenter, factory worker, longshoreman, etc. 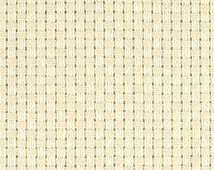 Caption [right]: the staggered 2-over, 2-under weave creates a strong fabric with a diagonal appearance. Denim is commonly cotton (woven of colored warp threads and white weft). US navy dungarees, farmers’ and mechanics’ overalls, and contractors’ jeans are examples of the workaday garments worn where sun or engine heat demands both the breathability of cotton and the ruggedness of denim garments. Wool is traditionally used in a similar twilled weave known as serge, common in UK constables’ uniforms. Broadcloth, corduroy, and seersucker each has its own characteristic weave. Broadcloth is smooth, tightly woven tabby, common in workers’ uniforms of many sorts. Seersucker is a fabric woven with alternating narrow stripes of loose and taut tension threads that produce a slight puckering in the loose-weave bands, often using white for the loose stripes and colored warp thread for the taut stripes. Heavy seersucker in dark blues was used rail workers’ uniforms in the steam age, and remains traditional there. Lightweight seersucker suits are a common sight among professionals in the souther n US, both humid and desert climes, and women’s Armed Forces summer uniforms are made of cotton seersucker. Duroy was an English coarse weave sometimes used as a strainer. 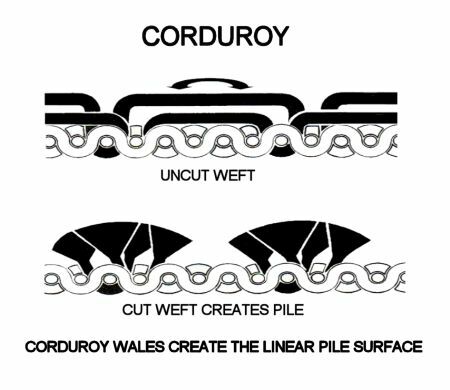 Cord-duroy added thicker cords in the warp direction, similar to the modern fabric “ribcord,” but with the cords closely laid, and evolved into the pile (napped) fabric we know today. Modern corduroy consists of a woven fabric with rows of pin-width velveteen stripes. This classic corduroy is known as pinwale (wale meaning a raised weal or stripe); wide-wale corduroy having wales up to 1/2 inch have been made at times. Fabrics with pile have extra threads woven into fabric and cut to stand up at right angles to the flat surface. Such are traditionally luxurious: plush, velvet, velveteen, velour, fur felt. Corduroy is made the same way, and can fall into either category depending on its other qualities. Also, satins with their shining surface and sliding hand evoke water in both appearance and touch. Such sensuous, luxurious surfaces correspond readily with things emotional, intuitive, psychic—the slippery senses. Velvet, once made only in silk, is now most commonly synthetic or rayon, with better quality fabric available in cotton. Silk-blend velvet may be found in specialty import shops. Velveteen, with its shorter pile and biased lightcatching quality, is routinely cotton. Unlike velvet, velveteen has a nap, a bias to the direction in which it catches the light, and how it feels to the hand, where one direction glides with the grain but the opposite direction bristles against the grain. Plush, like twill, simply describes the weave of the fabric, the deep, soft nap of one surface, and may be made of any fiber. Velour, a heavy pile fabric, is made heavier on sturdier backing for use in upholstery or similar applications; most modern velours use machine-knit (jersey) backing instead of woven. The formal silk top hat was traditionally made of a silk felt so deeply napped it is called fur felt—reflecting historical use of real fur to make hats. The historical slang word beaver meant a top hat, made originally of beaver pelt sheared to a smooth sheen with a distinct bias. Satin, orginally made of fine, smooth silk, makes the satin weave all the more successful at capturing light for a shiny surface. Cotton woven using this satin weave is called sateen. Caption [right]: Satin weave displays longer segments of warp fibers, allowing the smooth silk fibers to catch and reflect more light. One drawback to the satin weave is that these longer runs of fiber are more exposed to potential snags or damage, rendering the fabric less durable. Moiré fabric was originally known as watered silk, having a wavy appearance to its surface, as if it were rippled. Unlike satin-weave fabrics, moiré requires a sturdier weave, such as grosgrain or taffeta. Moiré may be woven of silk, cotton, wool, or rayon. 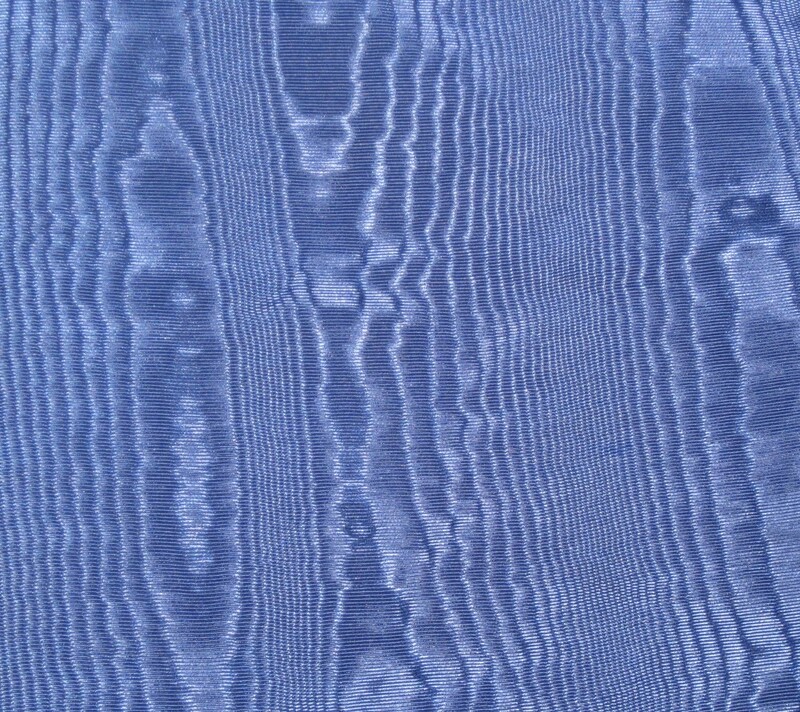 Caption [below]: Photo of taffeta moiré fabvic showing characteristic ovals and ripple patterns. Finally, there are the thick, heavyweight, or structural fabrics: monk’s cloth, canvas, heavy woolens, felts, and hemp or linen weaves. Duck cloth (usually called canvas; doek is Dutch for the word canvas) is a simple plain-weave cotton cloth of exceptional sturdiness. Used for sailmaking, uniforms, and workman’s garb, duck remains a workhorse fabric. In the late 19th century, the corporate inventor of “levis,” Levi Strauss & Co. patented the copper-rivet reinforced worker’s pants known worldwide today as blue jeans. (Yet another city name, the workhorse fabric jean was made in Genoa, or Gênes, in French.) Early in the company’s existence, Strauss experimented with brown duck as another fabric to make into dungarees (“bib overalls”) and jeans (“waist overalls”). Duck of various weights (7 ounce up to 18 ounce, measuring the weight of a 36×22-inch piece; heavier duck is made but not numbered) may be used for everything from clothing and laundry bags, to duffle bags and hammocks and sandbags. Historically, canvas met the needs of sails and sacks, sandbags and tents, capable of withstanding long exposure to sun and weather when finished as “oilcloth” with several coats of linseed oil. 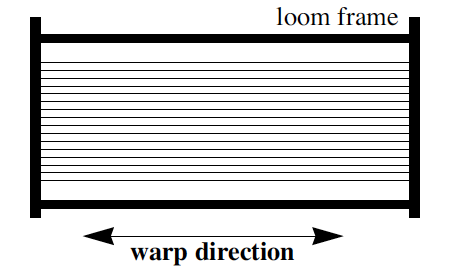 Caption [right]: Plain or “tabby” weave. The term woolens describes the whole range of heavier, bulkier wool fabrics, regardless of weave. The difference between “worsted wool” and “woolen” is the length of the fiber; worsted uses long-staple wool that spins fine and strong, while woolen is short fiber which must be spun thicker and is necessarily much fuzzier from all the short-fiber ends in the thread. Wool is the fiber, woolen and worsted are the types of wool. Wool fiber has been re-used in the past. The word “shoddy,” specifically meaning wool fiber re-used in new wool fabric which quickly breaks down in use, dates to the U.S. Civil War 150 years ago. Shoddy has come to describe any poorly crafted work. Hence, the wool industry trademark for “virgin wool” (Eurozone “new wool”), which has appeared on Pendleton Woolen Mills labels for decades. 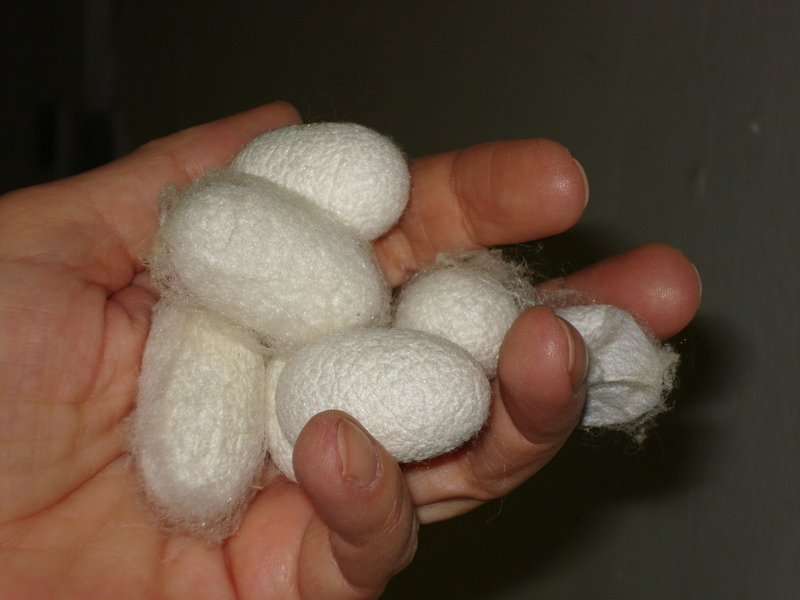 Woolen, made of carded wool, has a fairly short staple (natural filament length), is likely to felt when laundered; one reason why laundering wool is not a task for the novice. 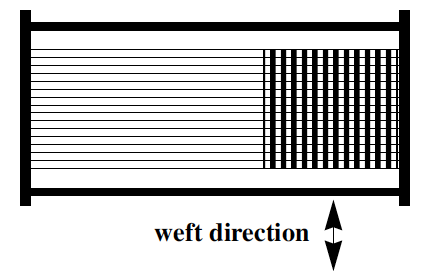 Caption [left]: A woven woolen blanket that’s been felted, either accidentally, or in manufacturing. Monk’s cloth describes a particular heavy, loose-weave fabric that was historically made of wool. Modern cotton monks-cloth is easily recognized—the weave pattern uses a very loose tabby pattern of four threads warp and weft interwoven. The resulting fabric resembles the appearance of a cotton thermal blanket, in which air pockets woven into the fabric act as insulation in hot or cold weather. Monk’s cloth woven of solid color cotton often is available at modern fabric suppliers. Felt, although sometimes an entirely non-woven fabric, has also been made by weaving heavy wool yarn and shrinking and napping it to produce an extremely warm fabric with a water-repellant surface. Modern felts are usually synthetic fiber, non-woven, and used solely for non-structural craft work. However, the process of felting wool can be closely reproduced in a modern washer, as many an incautious launderer still learns today. (Hot water, soap, and steady, gentle agitation allow the surface of the wool fibers to ratchet more and more tightly together.) Thus a deliberately felted blanket woolen can produce a fabric similar to a traditional felt, greatly improving the insulation value and adding it to the woven structural strength. Whether your fiber project requires a careful choice of magical correspondence or just the best fiber and fabric for a purpose, some understanding of the options on today’s market can help modern pagans choose to suit their needs and ends. Footnote: magical consideration aside, walking lightly on Gaia’s surface is helped by choosing natural fibers over synthetic ones; no one has ever answered one question satisfactorily: what happens to polyester fabric in a landfill? So far as we can tell, xeno-archeologists of the 40th century may find those wrinkle-free knit slacks and polyester leisure suits in near-wearable condition when their humanologists dig our middens! This entry was posted in About Wicca, Fibers, Open Ciricles, Paganism, Wicca and tagged correspondences, cotton, elements, fibers, linen, natural fiber, Pagan, silk, witch, Witchcraft, wool on September 17, 2015 by Deporodh.